My mom had me make this for her mother-n-law for Mother’s Day. I love these wreaths. 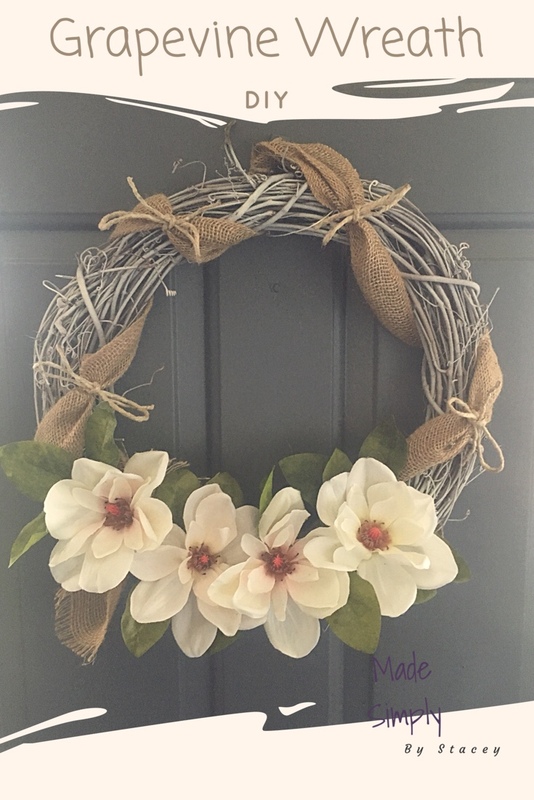 I made the grapevine wreath a little different by spray painting the grapevine wreath with chalk paint. The magnolias gave it a farmhouse touch. at Amazon. Or you can try Dollar Tree. Attention: Made Simply by Stacey participates in affiliate links and banners. This means if you purchase a product through these links and banners I can earn a small commission to help with the costs of my blog at no additional cost to you. See full disclaimer. I wrapped burlap ribbon around the wreath then tied a generic knot. I tied jute rope in sections around sections of the wrapped burlap, see below. First clip your bouquet and leaves using a wire cutter. Arrange your flowers and leaves how you like them. Just poke the stems in the grapevine. Sometimes I hang the wreath on the wall to get a feel for what it’ll look like. Then pull them out and hot glue the tips and poke them back in. I did hear that if you are hanging them outside it is best to use flower glue. Fluff your bouquet moving leaves behind the flowers and adjust the burlap until you get the desired look. Ta-da now you have a beautiful wreath. This is BEAUTIFUL! I love how full it is! Great instructions too! Simply beautiful. I made a wreath years ago but I have no idea where it is now. Would make a lovely project for my kids and I. Thank you. That would be a great project.